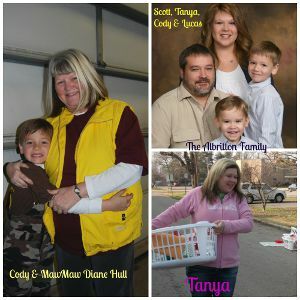 This month we want to honor a family who has been a big help in so many ways here at LBFOL. Diane Hull has helped behind the scenes since we started in September of 2011. Her help has been a tremendous blessing and very much appreciated. Without her, we may not be where we are today. She has helped with every prep day and delivery event days, delivered baskets all through out the year, helped pickup items, filled in for meetings when I couldn’t be there and has donated her time and items for the baskets plus much more. I appreciate her support and willingness to help in whatever ways she is able. Thank you Diane! Along with Diane, we’d like to recognize her daughter Tanya Albritton and her family, husband Scott and sons Cody and Lucas. Tanya, Scott, Cody and Lucas have helped us with both Project Christmas Baskets and Spring Clean 2013. They have worked behind the scenes getting items ready, loaded and unloaded trailers for the events, delivered baskets throughout the year and donated their time and items for the baskets. Cody and Lucas have helped deliver baskets, put stickers on items and loaded the trailer. We are so thankful for their help and support. When asked to help they are eager to be there to get it done and help wherever needed. Thank you Tanya, Scott, Cody & Lucas! Without the monthly help of families and others who have volunteered their time, LBFOL could not do what we do on a daily basis. I love and appreciate each one who has and are helping us! God bless each one! If you would like to donate in honor of this family, you can do so through PayPal or our mailing address. All donations are tax deductible and very much appreciated!